Let us not develop an education that creates in the mind of the student a hope of becoming rich and having the power to dominate [but one that forms] the lofty ideal of loving, of preparing oneself to serve and to give oneself to others. It was June 2014 and 20-year-old Lucas Patchett had just returned to Brisbane from a working holiday in Canada. He was about continue his Chemical Engineering course at the University of Queensland when he met up with his ex-school mate, Nicholas Marchesi. That meeting would turn their world upside down. 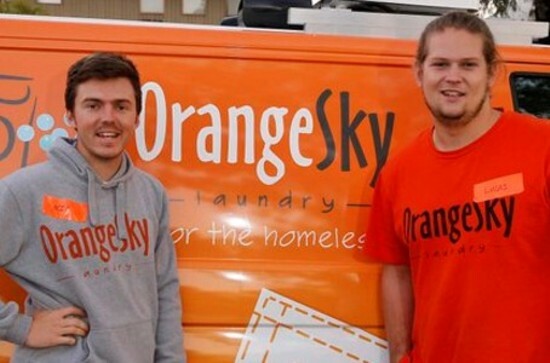 Together they came up with the idea of starting a mobile laundry service for homeless people. Lucas deferred his university study and Nic gave up his job as a TV cameraman. Within weeks they had registered the name Orange Sky Laundry and were working franticly to fit out Nic’s old van as a mobile laundry. When Nic and Lucas finally took their bright orange mobile laundry van on its first outing on October 10, 2014, they weren’t sure what sort of reception they would get. They had spent weeks fitting out the van with two donated washing machines, two dryers, water tanks and power systems. Some people said it was a crazy idea. They drove the van they called “Sudsy” to a park where food was being given out to homeless people. At first there was confusion as no one had come across such a thing as a mobile laundry for free. What was the catch? One person, Jordan, had two T-shirts in his backpack and was willing to give it a go. Lucas chatted with him while the washing machine did its job and was amazed to find Jordan had completed, some eight years earlier, the same engineering course Lucas was currently undertaking. Somehow things had gone wrong and Jordan had lost his job and without family support had end up on the streets. That night Nic and Lucas proved their belief that there was a need for a free laundry service but also recognised the importance of listening to people’s stories in a non-judgemental way as they waited for the clothes to be washed and dried. From that point on they always carried six orange chairs with them for their “conversations with friends”. In the two years since that inauspicious, mostly self-funded start by Nic and Lucas, their little scheme has grown into a national enterprise with ten vans operating across 66 locations around Australia and growing. Nic and Lucas believe it’s these conversations that make Orange Sky such a powerful force for reconnecting with people. Lucas cites the case of the man who had his closes washed hadn’t spoken to a single person in the previous three days. On 25 January 2016, Australia Day, Nic and Lucas were named the 2016 Young Australians of the Year. This award has given publicity for Orange Sky and the opportunity for the two or them to tour the country in 2016 to tell their story and speak about their mostly forgotten friends, the homeless. In Australia it’s often stated there are over 100,000 people homeless each night. This figure is based on the latest data available, the 2011 Census conducted by the Australian Bureau of Statistics (ABS). According to the ABS, around 60 percent of these homeless persons live in severely crowded dwellings or stay in supported accommodation for the homeless. Another 35 percent are homeless persons staying temporarily in other households – they are often described as “couch surfers” – or else are staying in boarding houses. The majority of people who become homeless do so for short periods of time but a few are long-term homeless. Research also tells us that one in eight Australians have been homeless at some point in their lives. Around 40 percent of homeless persons are between 12 and 24 years of age with the possibility of some becoming long-term (chronic) homeless persons. It’s estimated that some 7,000 persons sleep rough each night throughout Australia. People can become homeless for a variety reasons. Lack of affordable housing, coupled with poverty and unemployment are key structural factors. Personal circumstances such as poor physical or mental health, substance abuse, gambling, family breakdown, domestic violence and physical and sexual abuse are reasons homelessness may occur. No one wants to be homeless but it can happen to anyone. John, 48, had a job earning him $150,000 a year as a pest exterminator but things suddenly went wrong when he was severely injured when he went to save a young child from injury. He then lost his job and shortly after split up with his partner. He’s now he’s living on the streets in downtown Melbourne. Living rough is uncomfortable, unhealthy and dangerous. They are avoided by most people who won’t even look them in the eye, as if they don’t exist. Others attack them for sport, for the fun of it. Fifty percent of homeless people admit to being attacked physically or sexually. Some have been murdered by being set on fire or knifed. Many instances of attacks go unreported. Governments are taking steps to alleviate the lack of suitable housing for the chronically homeless but there seems to be no end to the numbers of short-term homeless who just need a little help to get back on their feet. Nic and Lucas became friends while attending the same high school, St Joseph’s College, Gregory Terrace in Brisbane. Terrace is described as one of Queensland’s most prestigious private schools. Founded in 1875 by the Christian Brothers it has a rich history. Academically Terrace students rate as top performers in Queensland. In 2015, 53 percent of Year 12 students achieved an OP (Overall Position) score of 1-5. The OP score, which ranges from 1 to 25, is used by Queensland universities to place school leavers in courses. Among Terrace’s alumni are 15 ex-students who have played rugby for the Wallabies, Australia’s national rugby union team. There are also 17 Rhodes Scholars, and, since 2013, a judge on the High Court of Australia. Edmund Rice was a truly remarkable man, a person who we would describe today as a social entrepreneur–that is, someone who establishes an enterprise with the aim of solving social problems or effecting social change. See Edmund Rice – Social Entrepreneur. Many of the students at St Joseph’s Terrace come from comfortable backgrounds and are destined for a life ahead of them in high-paying jobs. Other students may come from families who are not so well off but make sacrifices to give their children the best education they can. One of the many Terrace ex-students who have absorbed the social justice message of Edmund Rice is Anthony Ryan, currently the CEO of Youngcare, a national not-for-profit organisation helping young Australians with high-care needs. After leaving Terrace in 1987 he started studying Economics at the University of Queensland with the intention of becoming a stockbroker. It was while he was visiting his brother who was working to assist homeless in Washington DC that he became exposed to the plight of the homeless. On his return to Australia he decided to become a teacher. “I saw another side of life that I thought I could have an influence on,” he said in a 2013 interview. In 1998 he was back at Terrace but now as a teacher. He wanted to create opportunities for students not to just learn in a classroom. “I wanted to make it experiential and I wanted them to challenge their stereotypes,” explaining his approach. In a social context, the “other side” of the gap are often reduced to stereotypes, such as: Asians, Muslims, asylum queue-jumpers, dole bludgers, druggies and gays. Even politicians and radio “shock jocks” use labels such as street gangs, leaners (those accessing government welfare) and illegals (asylum seekers who arrive by boat). Service-learning is a learning strategy in which students have leadership roles in thoughtfully organized service experiences that meet real needs in the community. The service is integrated into the students’ academic studies with structured time to research, reflect, discuss, and connect their experiences to their learning and their worldview. Price warns of the detrimental effects if such a program is not managed properly. “There is a danger that [the student’s] prejudice could be reinforced, false conclusions come to and stereotypes enhanced as a result of the service experience,” he says. To the homeless person, it comes across as being patronising, demeaning and disrespectful. Eddies Van now operates every day with each Thursday morning the Terrace student volunteers up early cooking breakfast and serving the homeless people at a park across from the Brisbane Private Hospital. Ryan says the idea of the program wasn’t just about feeding the homeless. “It was going beyond charity and was about actually sitting down with the people, making the students go out and actually mingling with homeless people, hearing their stories.” These people are no longer “the homeless” to students but are identities with names and faces. By the time Nic and Lucas attended Terrace, Anthony Ryan and Damien Price had moved on but the service learning program continued. Both Nic and Lucas were volunteers for Eddie’s Brekky Van when they were in Year 11 and Year 12, 2010-11. In Year 12 both were house captains and that’s when their friendship grew. What seems to be a spur of the moment decision by Nic and Lucas to start a free mobile laundry actually had years of nurturing as the foundation before entering into the path of social entrepreneurship. Bornstein and Davis suggest that a social entrepreneur requires a theory of change to show the path for spreading their idea, achieving the desired impact and influencing others. A useful theory of change is the Can-Do Wisdom Framework. 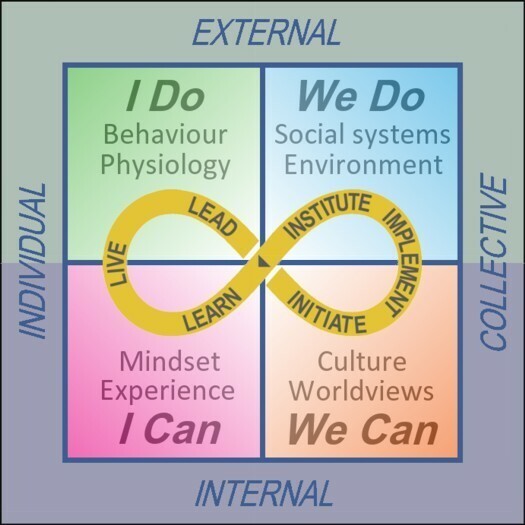 The gap that Damien Price talks about is between the I Can quadrant and the We Do quadrant, specifically the initial mindset of students based on commonly-used labels and the social system that has allowed homeless people to exist in a wealthy country like Australia. Both NIc’s and Lucas’ mindsets about social justice and homelessness were developed and changed by their service learning experiences. Their immersion in the program has given them a level of empathy they didn’t have before. They have also been given life-long guidance by their parents who have been highly supportive of their efforts. For example, Nic’s mother, has worked in the area of homelessness and believes everyone has the right to safe, secure and affordable housing. Nic and Lucas know that others in their social group are looking for something meaningful in their lives and it has been their vision from the beginning to tap into that resource for volunteers. Both Nic and Lucas are people of action and have the courage and fortitude to persevere when others tell them their idea is crazy. Nic is highly creative and doesn’t take no for an answer. He was running his own business while still a high school student. While some of Nic’s efforts might be described as ‘slap dash’, Lucas, the engineer, insists on things being done properly. They complement each other nicely. The brief time it took from floating the idea to actually being on the road with a mobile laundry – a world-first – is truly amazing. Nic and Lucas took direct action themselves to address a need they could see. Other than the initial donation of two washing machines, they poured their own resources of money and time in to the project. Being savvy with social media and having great presentation skills has meant they have gained a world-wide following and have received extensive press coverage that any business owner would die for. Receiving the Young Australian of the Year award for 2016 has meant they have had the opportunity to address groups around the country into what they are doing. Through the use of effective communication channels Nic and Lucas have had great success at recruiting volunteers, initially from their circle of friends, but now Australia-wide. There are now 600 participating in regular shifts at the ten vans now operating across all states of Australia. Since it costs $100,000 to put a van on the road, this would not have been possible without sponsorship and donations. Training volunteers is an important aspect of providing a consistent service along with having a distinctive brand. The name Orange Sky comes from a song by British musician Alexi Murdoch about helping those in need. These vans are much more advanced than the initial van they put together themselves. The organisational structure has also developed. There is a CEO and now a salaried marketing person. What they’ve done for homeless people in washing their clothes for free has been well received. But it’s the non-judgemental interactions with their “friends” that has made a difference to lives. In the two years since starting out, 254,000 kilograms of washing had been performed and almost 65,000 hours of positive, genuine and non-judgmental conversation has taken place. In some cases those who have recovered from their stint at being homeless have come back as volunteers. Two years on they are still in the process of scaling up the availability and scope of services to the homeless and eventually aim to go world-wide. The aim is also to go beyond washing clothes to train people and offer job opportunities for homeless people. Nicholas Marchesi and Lucas Patchett demonstrate social entrepreneurship in action. Even if a government was committed to deliver such a project, imagine the time taken, the cost involved and the likelihood of a poor result. There are plenty of examples of failures government initiatives, such as the “Energy Efficient Homes Package” where two people died, and the systemic failure of the Vocational Education and Training (VET) funding system resulting in billions of dollars being wasted for little return. Governments typically approach issues from the outside. For example, the Indigenous programs designed in Canberra consistently do not achieve their goals in improvements in violence levels, health, school attendance and household budgeting and purchasing. Social entrepreneurship understand problems from the inside. Their measure of success in the achievement of the desired outcome for the recipients of a program. It’s also becoming increasing apparent that governments are often failing to deliver needed services and support to sections of the community. They are also often failing to safeguard the environment, protect human rights, collect appropriate royalties and taxes from multinational corporations, regulate financial institutions, and ensure workers conditions and pay are fair. The 9/11 events have shown us what a small number of terrorists can do to a nation. But it also means that a small number of citizens acting as social entrepreneurs can also achieve much good for a community, for a country and for the world. Kickul and Lyons [13.] identify several unique qualifications that social entrepreneurs possess. These include passion, nimbleness, transformation enabling, mission focus (as apposed to profit focus), and social innovation. Some governments are recognising the importance of social entrepreneurs because public funds are under increasing pressure from reduced economic growth. A recent survey of 42 countries rated the USA as the best country for social entrepreneurs whereas Australia was ranked 26. Two major differences from the USA were, firstly, the lack of understanding by the general public as to what social entrepreneurs do, and secondly, there is much less Government policy support in Australia for social entrepreneurs. Social entrepreneurship is vitally important for us in the twenty-first century as a means for social improvement and making the world a better place. Social entrepreneurs need to possess the skills of empathy, teamwork, leadership and driving change. We all need to recognise this and play a part in either pursuing or encouraging the development of these skills as St Joseph’s Terrace does for its students. 1. Annual Information Statement 2016 – Orange Sky Laundry INC, Australian Charities and Not-for-profits Commission (ACNC), Web: www.acnc.gov.au/. 2. Aisha Dow, , “Shocking’: Record numbers of homeless people sleeping on Melbourne’s streets,” The Age (June 9 2016). 3. St Joseph’s College Gregory Terrace, Spring Hill, Web: http://www.erea.edu.au/our-schools/erea-member-schools/st-joseph-s-college-gregory-terrace-spring-hill. 4. Catholic Education Week 2013, Youtube video https://www.youtube.com/watch?v=NPfKEsq-uqc. 6. Susan Benigni Cipolle, Service-Learning and Social Justice (Lanham, Maryland: Rowman & Littlefield, 2010). 8. Emilie Ng, “Reaching out to the margins makes better students,” The Catholic Leader (April 20, 2016). 9. Mike Bruce, “Damien Price a brother in alms,” The Sunday Mail (Qld) (May 15, 2011). 10. David Bornstein & Susan Davis, Social entrepreneurship: What everyone needs to know (Oxford: Oxford University Press, 2010). 11. Helen Chryssides, “Two of us: Lucas Patchett and Nicholas Marchesi,” Sydney Morning Herald (May 21 2016). 12. David Bornstein & Susan Davis, Social entrepreneurship. 13. Jill Kickul & Thomas S. Lyons, Understanding Social Entrepreneurship: The Relentless Pursuit of Mission in an Ever Changing World (New York: Routledge, 2012). 14. Thomson Reuters Foundation, “The best countries for social entrepreneurs,” Web http://poll2016.trust.org/. Posted in can-do wisdom, social entrepreneur and tagged changemaker, Christian Brothers, Damien Price, Edmund Rice, homeless people, leadership, Lucas Patchett, Nicholas Marchesi, Orange Sky Laundry, Service-learning, social entrepreneur, social entrepreneurship, St Joseph’s College Gregory Terrace.